This three-part blog describes how to develop a competency-based training profile and scope document. Competency-based training emphasizes what the learner will be able to do after completing the training. Competencies are the support knowledge and tasks a person must acquire and perform to do the job safely, effectively, and efficiently. The training profile and scope document list the competencies for which training will be developed. These three blogs focus on using thinking strategies to design and develop a relevant and useful competency-based training profile and scope document. Part 1 applies thinking strategies to develop the first cut at identifying the competencies for the training profile. Part 2 uses thinking strategies to develop a scope document to define the content of each competency and refine the competency-based training profile. Part 3 suggests ways to sequence training so that it fits the job and is developmental. •	What training is important? training,and maintain the training program? program should achieve—entry level or exemplary level? Over the past thirty-five years, I have been developing technical training programs for oil, gas, pipeline, pulp and paper, and MDF manufacturing industries. Most of these training programs are for operators and maintenance personnel, from entry level training up to control centre operator and first-line supervisor training. Throughout these three articles, I will identify some key challenges and solutions to design an effective training profile. The focus is on using thinking strategies to identify the competencies for the training profile. I also explain important thinking strategies that contribute to developing an effective training program. A well-developed training program will reflect the way the organization does business including lines and limits of authority, and communication and documentation protocols. To identify the competencies for a customized training program, it is important to have a general understanding of the organization. As a starting point, I use the following business model to determine the key constituents of an organization. Note that the arrows indicate there are close relationships between the constituents. For a detailed explanation of the business model, refer to The Exemplary Worker: JobThink. A strong emphasis is placed on the interrelationships of the constituents. A practical understanding of the organization helps in developing training that focuses on the user group’s efforts and on them making decisions in the best interests of their organizations. Each of the constituents of the business model is summarized below. Mission: defines what the organization does and its strategy for business success. Technology: If the organization uses technology to make products (e.g., petro-chemical industry), then the technology dictates many of the tasks that workers must do. Tasks: If the organization provides services, then performing tasks is the main way to generate revenue; tools/equipment provide support for carrying out the work. For large organizations, the tasks are broken into disciplines. Before identifying the competencies, it is important to clearly identify the target audiences and their working relationship with other disciplines. It is very important to identify the qualifications of the audience entering a new job position. Many of the profiles I have developed are for employees starting at the entry level and progressing through several positions. I identify the hiring criteria for education, training, and experience. Sometimes, it is difficult to identify competencies for training where people have experience in a different industry. For example, a millwright who worked in a saw mill may have a limited set of experiences that are directly transferable to doing work in a gas plant. 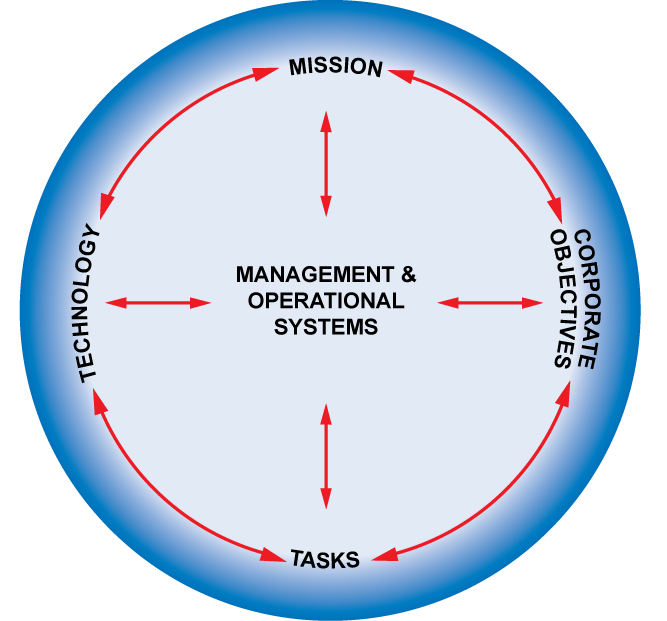 Management and Operational Systems: coordinate work and establish expectations/standards of performance. Corporate Objectives: Of particular interest are the corporate objectives. Corporate objectives provide direction for using technology, performing tasks, coordinating work to effectively achieve the mission, and for developing relevant training. The following table lists areas of concern common to many organizations for which corporate objectives may be developed. A list of the areas addressed by corporate objectives can be generated by expanding the organization’s strategic business objectives or by using LO-PEMEO. LO-PEMEO stands for Loss and Optimization of People, Equipment, Materials, Environment, and the Organization. The conditions, actions, and events define the work environment and the dynamics within the workplace. For more information about LO-PEMEO, refer to the blog Linking corporate, job, and employee performance. Some organizations issue strategic business objectives to identify what must be done well to be successful and to give employees direction about where to put their energy and focus. For example, leaders in an organization may believe reliable service and satisfied customers is essential for business success. Organizations may identify five to eight strategic objectives. Within a department, the list of objectives may be expanded to address issues specific to the department’s mandate. Key Performance Indicators may be created for the department to assess how well the department is doing to contribute to business success. Corporate objectives are fundamental to exemplary performance because they define what is important to the organization, the job, and workers. Corporate objectives provide a formal link between organizational goals and worker performance. I use the corporate objectives throughout the training development process, from designing and developing the training profile, to developing training and assessment resources. Using the corporate objectives is important to ensuring the training is relevant, useful, and practical and contributes to business success. Before starting any training development, I work with my customer’s management to create the list of corporate objectives and to use terms that fit the organization. The training profile is developed during profiling workshops. Workshop participants are selected from the specific audience targeted by the training because they know their jobs the best. Often a supervisor will attend. Groups have varied from three participants to twenty. I prefer eight to ten participants. Sometimes participants leave during the profiling sessions and are replaced by others. For continuity, it is important to have one or more participants attend all the sessions to be able to explain the thinking that has been used to identify specific competencies and the related content to new comers. Because the participants know their jobs the best, they can often provide a better explanation of the thinking than I can. Three to five full days are required to identify the competencies and develop the Scope Document. Two of us from HDC work together to provide the leadership for the workshop. I start the workshops by explaining the differences between norm-referenced and criterion-referenced training. (Norm-referenced training compares a learner’s performance against the whole group’s performance. Criterion-referenced training defines what the learner must do and know to specific standards to complete the training.) Then I explain competency-based and mastery-based training and their importance, especially for safety and some critical operations. An 80% pass is not satisfactory to mitigate risk. The feedback I have received from participants is that they really appreciate the explanation, especially the implications of competency-based training for assessing performance. Refer to the book Interviewing to Gather Relevant Content for Training for a more detailed explanation of a training profile. Next, I introduce the corporate objectives and how they will be used to determine training and to eliminate training that will not give the organization much pay back. I use flip charts mounted on a wall. Here is a typical example of tying the corporate objectives to job applications. Not all tasks are equal; some tasks have a major impact on the corporate objectives whereas other tasks have only a minor impact. The tasks that contribute to productivity and/or can create the risk of experiencing losses to PEMEO (i.e., LO-PEMEO) should be identified as part of the training program. Some tasks have only a minor impact on the corporate objectives. We will not include a task in the training if it has a minor impact on the corporate objectives. For high level training, complex tasks, and decision-making, employees need relevant knowledge. 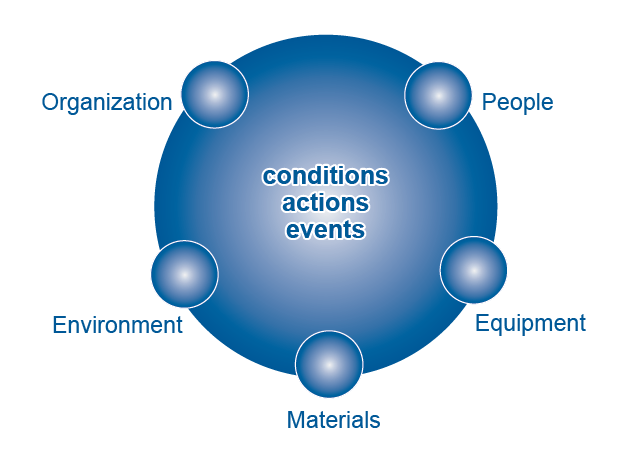 Within a person’s roles and responsibilities, the knowledge required involves the variables (e.g., temperature, pressure, composition, specifications, speed, dimensions) that the person must use, monitor, adjust, change, or respond to. These variables are examples only; the specific variables are job dependent. Only knowledge relating to the variables that fall within that person’s roles and responsibilities should be selected for training to ensure the training is relevant to the job position. I tell the workshop participants that we will use this chart to select competencies for training, eliminate competencies that will not have much value, and, later, for identifying relevant content for the competencies when we develop the Scope Document. The chart is very helpful for keeping the participants focused on identifying relevant, useful training. I also point out to the participants that they know their jobs the best and that we (the workshop leaders) are specialists in designing and developing training. I tell them that it’s the best of two worlds working together to develop a useful and practical training program. Just about all of the participants in profiling workshops prefer to first identify the categories of he competencies; it helps them organize their thinking. Then we brainstorm the competencies for each category. I tell participants that the competencies must be of a practical size that fits/aligns with the job and is useful for training. The two HDC workshop leaders write the competencies on 5 x 8 inch cards and mount them on the wall where the participants can see them. Initially, we want quantity not quality. For each competency, I try to understand how large it may be. If I have concerns about the size of the competency and the brainstorming process slows down, I ask the participants to determine if a competency should be split into two competencies or if competencies should be moved to different categories (e.g., generic knowledge). Does the competency fit the job? Are the breaks between related competencies practical and logical? Competencies that apply to a specific facility: site orientation and safety training. Some generic knowledge may also apply. For example, Describe Pressure, Temperature, and Flow, and Describe Combustible Gas Measurement. Some competencies that appear to be generic should be task specific to facilitate learning. For example, Describe Couplings could be generic. There is some good learning about many different types of couplings for steam, air, and hydraulics. However, when grouping all the couplings together, the trainee may not have an opportunity to apply the learning for some couplings for a long time and forget critical safety and installation issues. It would be more effective to address the safety and installation issues where a specific type of coupling is going to be used for a task. In this case, a generic competency would not work well. Competencies that apply to a discipline: When the training program is for several disciplines, there may be opportunities to produce generic training that applies to more than one discipline. For example, a site-specific Describe Combustible Gas Detections Systems could apply to operators and as an introduction for maintenance personnel. Maintenance personnel would then take more advanced training to install, test, and calibrate the detection systems. Competencies that are common: Sometimes a competency can apply to two different plants or systems that share some utilities. In this case, some site-specific training could apply equally well to an operator in either plant. For example, where steam is used in both plants and there is some steam piping between plants, some operator actions could affect both plants. Some site-specific training could be common to steam operators at both plants such as for equipment use in both plants and site-specific competencies such as Describe and Trace Crossover Piping. If an operator completes the training in one plant and then moves to the other plant, the training does not have to be repeated. Competencies that are similar: Some operations have many small sites (e.g., well sites) that have similar equipment but the operation of the equipment can vary from site to site. Generic training can be developed for a specific piece of equipment (e.g., heater treater, line heater) to explain how the specific type of equipment operates but, because each site has different operating conditions and peripheral equipment may be different, the operation of each site may be different. To minimize the development of training resources, I have developed training on how a specific type of equipment such as heater treater operates for a complex site. To address differences in operating the equipment at each site, I have developed a list of variables (e.g., flow rates, temperatures, pressures) that the operator must monitor and adjust at the sites. For each site, the coach and operator specify the parameters for each variable. The list is then used for training and assessment on operating the equipment. Procedures for operating the specific equipment may also be developed. I keep the profiling workshop participants’ focus on identifying the competencies and not on how the training is going to be delivered, although the method of delivery may be implied. Sometimes customers have developed internal training or use vendors. For tasks, on-the-job coaching using approved procedures is the most likely method for training and assessments. In some cases, a simulation is appropriate and is identified in the competency statement (e.g., Participate in emergency response simulations). When the group is satisfied that they have identified all the competencies for training, we put the competencies into a logical sequence that tends to be developmental. The sequence of the entire training profile, however, is not necessarily the sequence used for training. For some competencies, I discuss what the competency involves to determine if the wording is satisfactory for explaining the intent of the competency. In the meantime, the other workshop leader enters the competencies on a computer to be used when developing the scope document. We also create a code for each category and their related competencies for easy reference. We have now made the first cut at developing the training profile. The next step is to apply a variety of thinking strategies to scope out the critical information for each competency and determine where each competency of a sequence (e.g., for a process/system and multiple flows) begins and ends. During the scoping process, the profile of competencies often gets refined. It is very important to create a training profile that is complete, accurate, and what the customer wants before developing the training resources. Changing the profile during training resource development can be very costly. Have you used a similar strategy to develop training profiles? Are the ideas I have provided of value to you? Do you use strategies that I haven’t mentioned for designing training profiles that work for you?